From NBC: The midterm elections are turning out to be nearly as stressful as the 2016 presidential election — especially for Democrats. 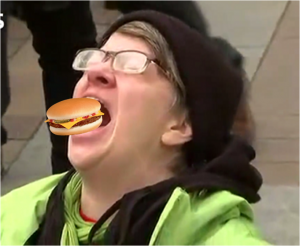 According to a poll conducted by YouGov and commissioned by the fitness site Daily Burn, Democrats are 50 percent more likely than Republicans to say they’re “eating their feelings” as a result of the current political climate. They’re also drinking more (a 2-to-1 ratio over their GOP counterparts). The ostensibly good news is that these stressed out Democrats are also working out more, by as much as 40 percent; but even exercise can be overdone. What appears to be happening among many concerned voters, is that they’re resorting excessively to the habits that help us de-stress, whether that’s eating, drinking or exercising. Binging almost always leaves us feeling crummy, even if what we’re binging on is as benign as Netflix (which Daily Burn’s poll found both Democrats and Republicans are doing plenty of in reaction to the fraught political climate). How do we stop the stress-induced madness? We turned to health experts for practical tips on managing binge-y behavior when stressed. Read the whole story here for the not-so-surprising ways to de-stress. This entry was posted in 2018 midterm elections, Elections, Health Care, Liberals/Democrats/Left, Trump Derangement Syndrome, United States and tagged easily triggered, exercise, Stress, unhinged democrats. Bookmark the permalink. What do y’all think the Demoncrats are going to do when Tuesday comes and goes and they lose big time at the polls (which I believe they will)? Will they slink away in defeat until 2020, or become even more out of control than they are now? Red Tsuami on Tuesday. Keep America Great. The first song I played when President Trump won the election was this – it used to be the democrats’ victory song as well! Nothing like turning the tables on them! Always among the best, Thanks for posting, taking to my site with link back Dr. E.. These people have to know what they believe in, and they have to know why they believe it. I’ll bet 90% or more of them DON’T. So next Wednesday, Nov. 7, in addition to crazy and demon-possessed, we’ll have fat & drunk Leftists. LOL – I just hope they don’t puke on my shoes.